Let’s face it, there are certain seasons when even we intrepid Arizonians will venture outside as little as possible. If we prefer to stay out of the baking sun, imagine what that sun is doing to your outdoor furniture? There are some materials that simply aren’t suited to desert living. Plastic is pretty much out, since you’ll likely have a melted puddle of goo in one season. Any most cheap materials will not hold up for more that a season (or less!). If you are lucky enough to have a covered patio or retractable awning, this will go a long way to protecting your outdoor furniture from oven-like temps. But if you need seating closer to the pool or you don’t have covered options, you need to be careful about your choices. You won’t save much money if you are replacing your furniture ever few months, so quality is key. 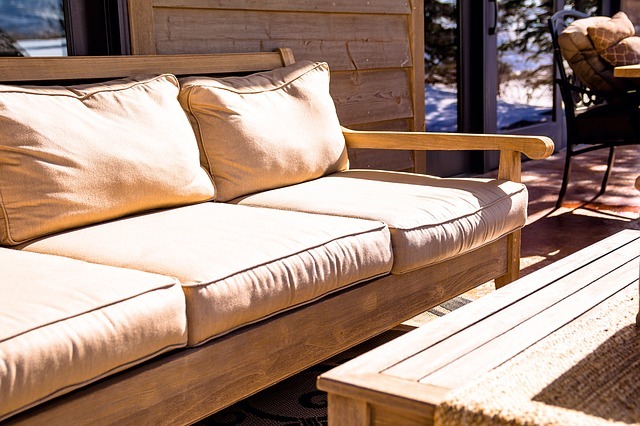 So what should you look for when buying outdoor furniture in our desert climate? The best option for our dry, arid climate is teak. Let’s face it, teak is expensive. But it will be more durable than most other natural wood options. Teak wood is made from the Tectona grandis tree, which must be imported from Burma, India, Thailand and Indonesia (hence the price tag). Teak’s natural rubber and oil content make it a good choice for the desert, as it’s resistant to rot and termites. Teak does has some special care requirements. If not treated regularly with oil, or protected with polyurethane, the teak will take on a silver patina when exposed to long periods in sun and heat. However, if you are ok with the grey look, then teak really doesn’t need much care at all. Marine Grade Polymer (MGP) is becoming increasingly available as a patio furniture option. It has the look of a really strong, high-quality plastic, but the production process makes it more resistant to fading and brittleness with sun exposure. It comes in many styles, including basket-weave and wicker patterns to suit different tastes. Powder-coated aluminum is resistant to fading, with the added benefit of not absorbing heat like other metal options. You don’t want to lay down on your pool chaise and get an immediate burn from hot metal! But, as with other choices, quality is key. Department-store quality outdoor furniture may not be as durable as higher cost models, so opt for quality when you can. 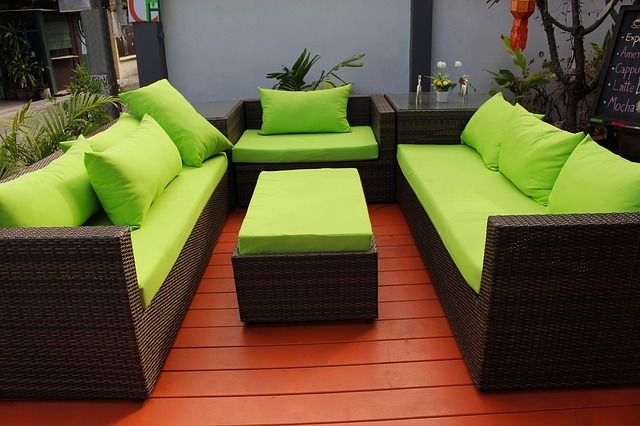 Most outdoor furniture will also have a cushion or fabric component as well, both for color and comfort. Fabrics made for outdoor use are treated to withstand sun exposure, but quality is key. Choose a high quality fabric if you want your cushions and sling-style fabrics to last multiple seasons. While it’s true that cushions and fabrics are more easily (and inexpensively) replaced than the furniture frames, you still want to choose for longevity when possible. Sunbrella is one option for high-quality outdoor fabrics. If your chosen product does not already have an ultra-violet inhibitor applied, you can purchase spray-on inhibitors that will add additional protection. Whether you are buying or selling in Fountain Hills, Susan Pellegrini and Karen DeGeorge are ready to put their care and expertise to work for you. Buying or selling, our first-class service comes with a wealth of experience and eye for detail, ready to focus on you. Visit our website to learn more and contact us or give us a call at (480)- 315-1575, we’re here for you.